Explore the ultimate first-person narrative through the eyes of a young boy and his tale of self-discovery. Our resource is developmentally appropriate for students with special needs who read at a lower grade level. Students predict who Mr. Henshaw might be, and why he would be receiving a letter. Find antonyms to the vocabulary words found in the novel. Answer multiple choice questions about Leigh. Students become Leigh and write their own list of questions for Mr. Henshaw. Solve the mystery of the lunch thief. Create a to-do list for writing based on what Mrs. Badger suggests to Leigh. 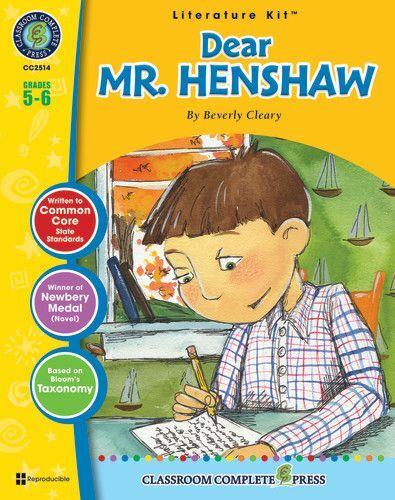 Imagine how Leigh and Mr. Henshaw's relationship would progress through the years and write a new letter from Leigh as an adult. Aligned to your State Standards, additional crossword, word search, comprehension quiz and answer key are also included. About the Novel: This Newbery Medal-winning classic story is about Leigh Botts, a young boy who lives with his divorced mother and misses his father. 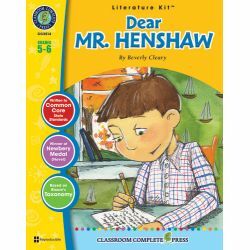 The book is a collection of letters written from Leigh to Mr. Henshaw, his favorite author. The letters show increasing emotional and literary complexity as Leigh grows. They also reflect his desire to become a writer. Through his journal, Leigh learns a great deal about writing and about himself. The diary reveals Leigh's loneliness at school and details his troubles with an unknown schoolmate. When Leigh is in sixth grade, Mr. Henshaw writes back to answer the ten questions Leigh sent to him for the Author Report assignment. Through his journal, Leigh learns a great deal about writing and about himself.